The Fire Side: The wedding. As most of you know, me and my other half got married recently! Well, the day was amazing! I was so nervous on the all morning - getting my hair done at the hairdressers whilst feeling sick is not the best combination...! The only minor hiccup to the whole day was about 20 minutes before we were due to leave (I'd still not got my dress on at this point!) one of the bridesmaid dresses split - the zip had broken! So cue emergency sewing into the dress...! That was the most stressful part and I thought I was going to be sick... but it was all okay in the end. I got a bit emotional during the service and then during the speeches, so there are some interesting pictures of me during that point, but it was all lovely, the registrar was excellent and put me at ease straight away. 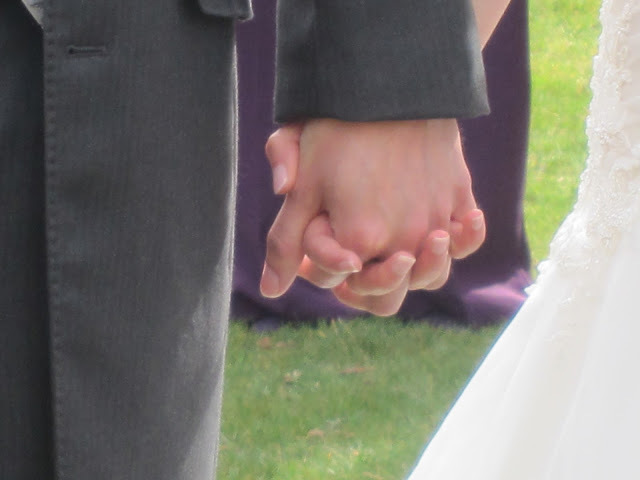 Walking down the isle and seeing everyone there made me a bit teary, and when I was standing next to OH during the ceremony, I was shaking like a leaf! The wedding breakfast food was amazing, but I didn't eat very much - wasn't hungry and my dress was quite tight! Didn't get any wedding cake, but never mind, everyone else commented on how delicious everything was. The evening do was also great - lots more people arrived, some of whom I haven't seen in ages! So that was good to get round everyone and have a mini catch up. The day was so quickly, but everyone made it the best day ever. This picture of me and OH sums up the day well; I have married my best friend, wearing the most gorgeous dress and wish we could do it all again! I am so delighted you had a lovely day. Glad you weren't sick... And sounds like you had a lovely day! Congratulations Nic. I'm glad everthing went well for you on your wedding day and I hope that it will mark the beginning of a long and happy life together. And there's nothing wrong with a bit of emotion! What a poignant romantic picture. So Glad that you enjoyed your day and your honeymoon.Here's hoping that you get the job!